An alert at STAR Labs in Metropolis brings the Man of Steel flying to the rescue. No sooner has he arrived, however, than he is knocked clear across the city by the super villain, Metallo. After a quick recovery, Superman returns, pelting his foe with heat vision blasts before delivering a punch that knocks Metallo into a building. When Metallo sees his reflection, he notices that his facial mask has been torn and that his metal skull peeks out from beneath. The sight enrages him, and he unleashes a dose of Kryptonite radiation at the Man of Steel before bounding off. As the effect of the Kryptonite wears off, Superman asks Doctor Gherhard of STAR Labs what Metallo was up to. From the doctor's account and some additional investigation, he deduces that Corben (Metallo) is attempting to track down his human corpus, which was buried after Corben's brain was implanted into Metallo's metal body. That night, in a Gotham City cemetery, Batman is investigating a series of recently dug-up graves and defiled caskets when Superman arrives and fills in the Dark Knight on Metallo's exploits. The Man of Steel postulates that the cyborg criminal likely dug up several random graves in the cemetery to confuse the authorities and to slow them from locating his grave. Suddenly, a rumbling from underground catches both heroes unaware as Metallo springs from the earth, carrying a casket over his right shoulder. Batman leaps into action, hurling phosphorous explosives that momentarily daze Metallo before he extends his arm into the Dark Knight, smashing him into a tombstone before beginning to choke him. Superman severs Metallo's arm with his heat vision but isn't quick enough to avoid a Kryptonite bullet shot from Metallo's revolver. Superman falls backwards into a grave just as Batman returns to the fight. He shoves miniature explosives into Corben's chest cavity and then drops into the grave where Superman is dying. Batman is just about to pry out the Kryptonite bullet when mud and rock begin to rain down on him. Metallo fills in the grave from above, entombing the two heroes beneath several feet of soil. Story - 4: Well, it's about time! Superman and Batman, my two favorite heroes, in one book! I've been waiting awhile for this! As a fan of the original World's Finest series, it always struck me as peculiar that DC didn't get its act together and bring it back. 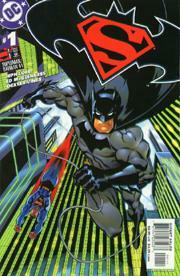 Over the years, there have been a series of Supes and Bats team-ups including the excellent World's Finest 4-part miniseries with jaw-dropping art by Steve Rude, the disappointingly drab maxiseries released a few years back, and the mixed lot of team-up appearances in the ongoing Superman and Batman titles. Hopefully, this series will prove to be one of the best representations of the two heroes. And speaking of which, this first issue, while a little slow, certainly looks to promise great things. Anyone who's familiar with Jeph Loeb's previous work (his most famous being Superman for all Seasons and Batman: The Long Halloween) as well as his on-going "Hush" arc with Jim Lee in Batman, knows that a Jeph Loeb story usually takes awhile to get off the ground, but once it does, look out! In this first chapter, we're treated to some cool action with Metallo (one of my fave villains) and clued in on a few enticing details. For instance, what's Luthor got up his sleeve? Who are those meta humans he's cavorting with? What does Luthor intend to do with that Kryptonite meteor? And what's with Metallo? Why does he want to recover his body? Is he trying to return to his normal body? And if so, who's promised him the technology and means to do so? And of course, what's the fate of our two heroes? At the end of the issue, we're left with more questions than answers... but I think it's fair to assume, given Jeph Loeb's track record, that we can expect these questions to be answered over the course of his run in a clever, exciting, and engaging fashion. 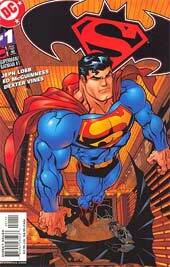 Art - 4: I wasn't the biggest fan of Ed McGuinness's work when I first saw it back in the pages of Superman. I thought he tended to overemphasize Superman's muscles and that he brought a cartoony look and feel to his work. Over time, I've either gotten used to his style, or he's begun to meet me half-way. Regardless, this issue is masterfully done. You can tell when an artist is having a good time illustrating an issue, and this is clearly an example of that. The panels buzz with energy, the action scenes are grandiose and epic, and the characters' postures and expressions play off each other wonderfully. It was also cool to see that McGuinness' John Corben was a dead ringer for the Corben from the animated series. It'll still take me a while to fully except McGuinness' style, but if he keeps drawing issues like this, it will certainly get easier. Cover Art - 4: Just when you thought variant covers were a thing of the past, DC releases two versions for this issue: one prominently featuring Superman and the other prominently featuring Batman. Both covers are in-your-face and gorgeous, and the use of contrasting colors (with an orange background for the Superman cover and a green for the Batman) help the heroes pop out from the page. Though I usually tend to be pretty good at ignoring the marketing ploys, I have to admit I fell for this one hook, line, and sinker. I just couldn't make up my mind which cover I liked more... so I bought both of them! Curse you, DC!!! !